Lake Living just got real here on Lake Greenwood! 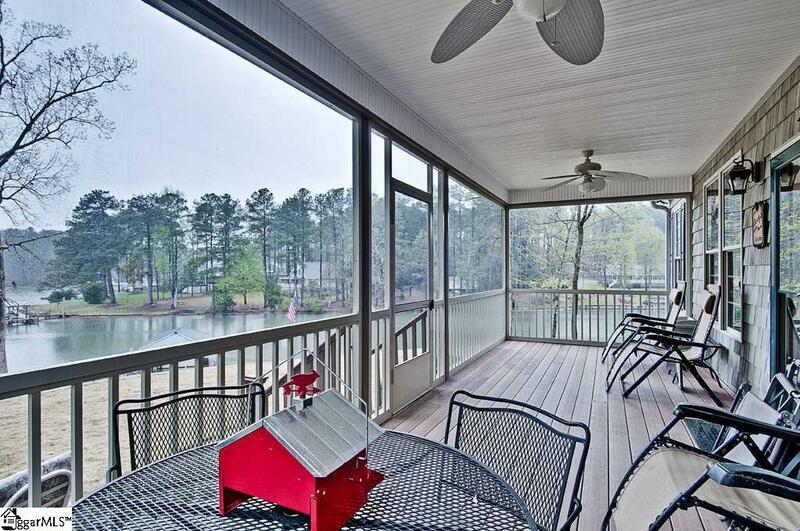 Have you always wanted to be on the lake but couldnt afford it well look no further. 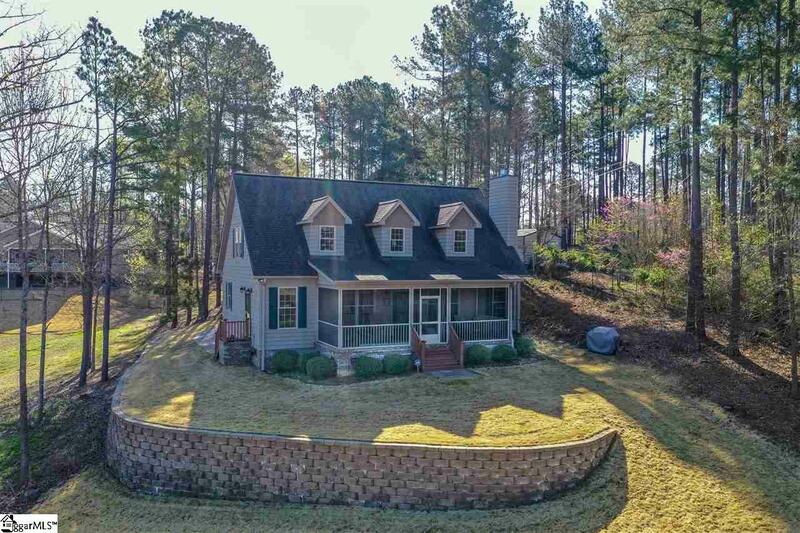 This Cape Code Style home is situated on 1.8 acres and has it all with 2202 HSF of living, 3 bedrms 3 bathrms a 19x16 bonus room, with a detached garage. 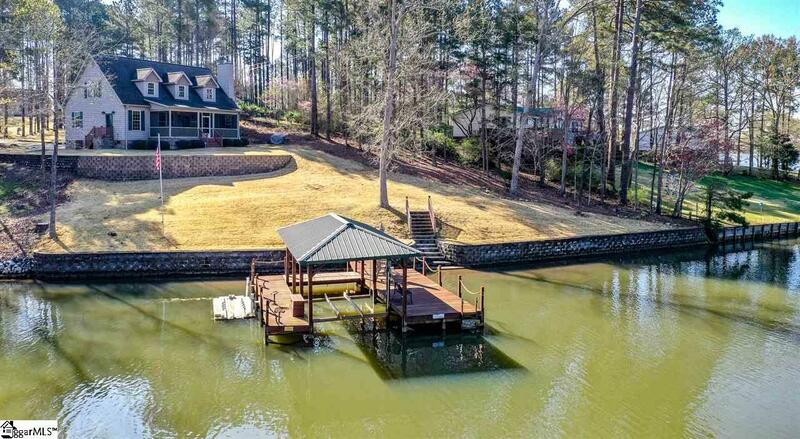 Having a large dock in place with decking providing plenty of seating area, a boat slip, boat lift, and jet ski dock you are ready to start the fun! Now lets get to the features of the home, which is well kept, low maintenance and no detail overlooked. Throughout the home you will find crown molding, 5 baseboards, thick window casements, most rooms having ceiling fans, the bathrooms have upgraded shower/tubs to include grab bars. In the Kitchen there are specialty made cream cabinets with coffee highlights and adorned with rope and crown molding with lots of cabinets, counterspace, drawers, 2 lazy Susans, pantry, Frigidaire Gallery Black Appliances, Insinkerator garbage disposal, and a great view of Lake Greenwood. The Family Rm with eye catching views of the lake with gleaming hardwoods that flow into the hallways, a gorgeous stack stone fireplace with raised hearth and cedar mantle burns wood and provides excellent heat and atmosphere. The Master bdrm that has a water view, nice walk-in closet which stretches along the 13 wall nice shelving and hanging areas, plenty of windows allowing in natural light. Once in the Master bath that features a comfort height double sink vanity, shower/tub with grab bar, & 2 storage closets adding plenty of storage. On the other end of the hallway is the Guest bath with comfort height spacious vanity with double sinks, 2 storage closets, tub/shower with grab bar an access to the hall but a separate access to guest bdrm.. The guest bdrm. just like the rest of the home has lots of natural light and a nice walk-in closet that easily fits clothes, ski vests, decorations, its all up to what you might need to store. Proceed up the wide staircase with hardwood treads, wrought iron spindles and oak handrails and to the right is the 3rd guest bdrm. (19x15). In this room the armoire will stay to have a place for your clothes, yet again with beautiful views of the lake, put a chair or bench in the dormer and take in the views. There is access to a full bathroom walk-in shower, w/seat and a grab bar, to include beautifully designed cabinets. Across the hall is the bonus room with a dormer window and plenty of room for a bed, couch, TV, again more windows with 2 different views of the lake. 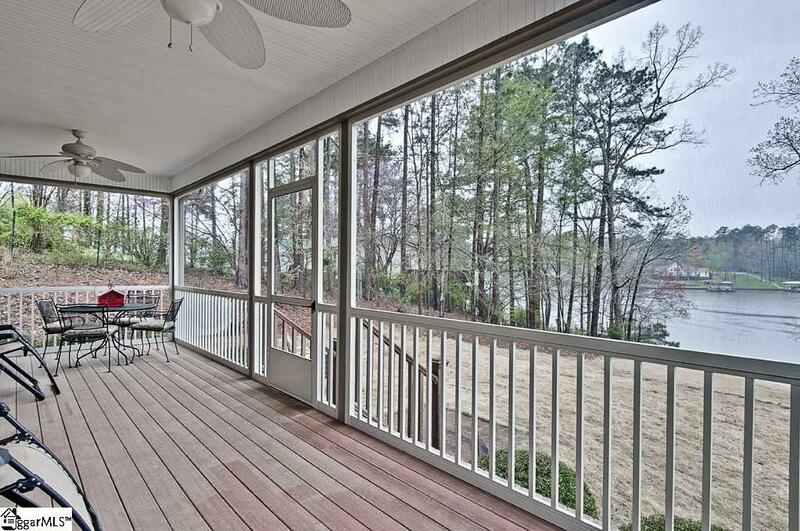 Then escape to the maintenance free 28x10 screened porch that overlooks the peaceful setting of Lake Greenwood. A porch this size its great for entertaining, eating, reading, sleeping, enjoying a cup of coffee in the early morning or sitting at night with the stars in the sky after watching the sun set on the calming waters. This porch has beadboard ceiling, 2 ceiling fans that provide cool breezes, plenty of seating area. The front lawn measuring 150 Foot of water front is a great place to have a picnic, sit and enjoy the sun, do some fishing yourself from your yard, entertain yourself with the water activities of boating, jet skiing, fishing. Then at night, host a bonfire, or take a deep breath, relax watching with glimpses of deer and listening to the serene sounds of the water. The garage measures 32x28 with an enclosed loft (approx. 32x14), double doors, and has an electric 22amp hoist with its own breaker box, wall to wall peg board system, workshop area, yard door, lots of lighting, & security flood lights with large oversized parking pad and a basketball goal. Rain Bird sprinkler system throughout Lot 14 that is fed from the lake with an 2hp Aeromotor Pump that once it is primed it holds water so no need to prime again to water. The home is located near different towns & highways the feeling of off the grid but not really!